A horror/thriller about a team of Child Protective Services workers who investigate a series of bizarre child abuse cases in the small town of Daylight, IN. ..a second-act switch that's both enjoyably jarring and impressively effective...a finale that's weird, surprising, and actually sort of creepy..what works here works pretty darn well. quite an interesting one...it does intrigue with its disturbing, realistic storyline. gives some nice twists and creepy moments to a familiar tale. 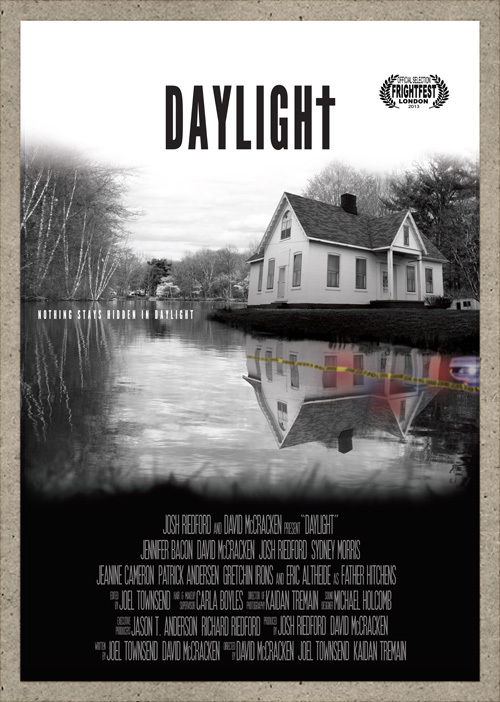 Daylight is now available across American Cable in Movies on Demand! The two unedited tapes reveal a series of three child abuse cases documented by three Child Protective Services workers: Jennifer, Josh, and David. Russell Olyphant, a boy with poverty-stricken parents who turn to Christian Science to heal him of a mysterious ailment, becomes Josh’s obsession. David investigates Susan Ellroy, the 14-year-old teacher’s pet who suddenly becomes sexually-charged at school, possibly the result of abuse from her father who disappeared years ago. Lastly, Jennifer finds a kinship with Sydney Irons, a 9-year-old whose unusual behavior may be the result of something far more sinister than anything she’s ever dealt with. As their investigation unfolds, the CPS team discovers that the town of Daylight harbors terrible secrets that will lead them down a dark path. One that will force them to confront their own secretive pasts and may link them and the three children to forces beyond their power and comprehension. A path that may lead them into the very bowels of Hell itself.